How do the descendants of Genghis Khan dance? Genghis Khan (born between 1155 and 1167; +18 August 1227) was a Mongol ruler (can, chan or khan) and conqueror. He united the Mongol tribes and founded an empire that stretched from China to the Danube. Originally the dances were shamanic rituals to emulate mysterious creatures and legendary heroes. This evolved from folk on religious dance to theater. The bujig is a traditional way of dancing with bending and jumping. Shamanic thoughts influenced the style of the old dances, as well as the shape and pattern of the clothes and accessories. The dances were later enriched by different families, nations and generations of performers. Besides dancing, there were also special religious palaces where dancers staged their performance. Nowadays, all kinds of dances are shown from folk to modern dance. A good example is the traditional religious "Tsam" dance. This should propose a modern international Mongolian dance. 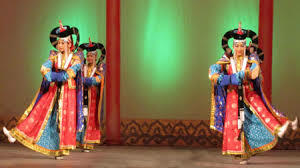 The tsam dance came from Tibet, but moved with the advent of Buddhism to Mongolia. Since the dance was performed until 1937. The dance is a mix of theater, dance, ritual ceremonies and folk tales. Women from the Altai Mountains dance bijlegee. A well-known musical aspect is the throat singing. This is sometimes called the unique contribution of Mongolia to the world. It is a replacement of musical instruments with all aspects of the vocal organs. Throat Singing is the sound that is produced from the larynx, throat, stomach and palate. It has the effect that are produced 2 notes and melodies together in one time.